This is totally off topic for this blog since it's main focus is 18th century but this creation that are going to take form during the next couple of days is a costume, so it kind of fits a little bit. I'm completely, utterly insane and this crazy idea kind of proves it. Yesterday me and Fantastic M, decided to go to Stockholm Burlesque on Saturday evening. Cool, great idea. But then the thought " I have nothing to wear" kind of ice skated through my mind. I do have a burlesque outfit, this one, but the corset is getting a bit raggedy after heavy use and it is also a bit big on me. But the under skirt is still going strong and still fit. I also have a pattern for an 1880's OB corset that I've already made a mock up of and that only needs a minor alteration to fit. I also have in my stash somewhere a red flock printed taffeta with medallion motif. Then I felt very accomplished and got back to work on the steam punk coat I'm making for a client. 18:16 My official work hours are finished and I start to transfer the changes from the mock up to the pattern. 18:29 Pattern is finished and I start to take out the corset pieces from the glittery fabric. 18:39 The cursing starts...there are not enough fabric for both a corset and a skirt! Arrrghh! Dives into the stash. 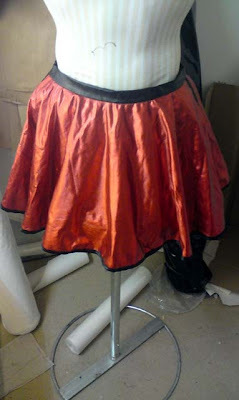 18:41 Found a skirt made of red metallic fabric. It needs a new waistband, shortening and some more ribbon decor added but otherwise its fine. 19:22 All the corset pieces are cut out from the fashion fabric and the seam allowances are covered with Fray Check. I leave them in the studio to dry and wanders into the main house, hungry and dizzy from the Fray Check fumes. To clear all things up a bit.I have until Saturday evening to make my self a corset, add som ribbon decor and change the waistband on the skirt. I think can make it. The corset will have black piping in the seams and black ribbon on upper and lower edge. The skirt will have ribbons aded so it looks like I've made it in sections instead of a full cicle.I think it will look good when finished. I need to find myself some fun stay ups or hose, maybe fishnet ? Or classic ones with a back seam? What do you all think? My vote would be for back seam stockings, I think they look wonderful with the right garb! It's so annoying when one hasn't enough fabric! But I think teh skirt will look very well with the corset.